Extra Pine tree bark is a high-quality one that we get from a Pine tree called North Pinaster , providing the garden with a natural, environmentally friendly, well cared-for atmosphere when decorating our gardens and garden boxes, going round the edge of plants and pointing out groups of plants or trees. If you need to work a rough estimate of how much extra Pine tree bark you will need to cover a certain area in square metres, tick on the link. It is also used for a good finish in indoor flowerpots and garden boxes. Besides, it?s an excellent material to protect the growing from changes in climate and rain shortage. It is recommended in xerogardening, as it helps to keep both temperature and dampness in the soil. as a soil for orchids and air-rooted plants. in gardening, as well in garden boxes or flowerpots as spread on the soil. to demarcate garden gravel roads and walking paths. in roundabouts, so as to preserve dampness. 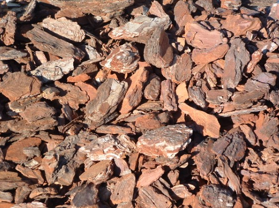 Pine tree bark is a wonderful means of decoration for gardens. Due to its light weight, it is recommendable to keep it away or protected from windy areas, especially when it is hardly watered at all and, as a result, becomes lighter.